Persimmon is definitely the star of my kitchen this week. They’re great as a snack or dessert just like apples or pears. They’re high in fiber and good for digestion. My current focus is to discover new ways of incorporating persimmons into my diet, in a savory way. I’ve already shared my new favorite soup recipe (let me know if you tried! ), and today I’m doing another savory persimmon recipe, this time with no heat involved. 1. In a small bowl, mix orange juice, zest, oil, maple syrup, season with salt and pepper. 2. 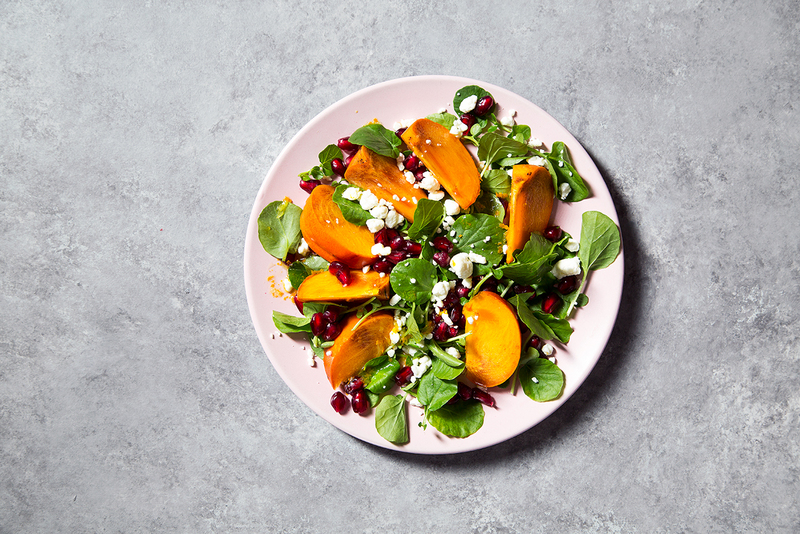 Toss the greens, persimmon and pomegranate seeds with the dressing. 3. Top with goat cheese crumbles and nuts if desired. Enjoy!